When your unit is a one-man-show and that one man is Le’Veon Bell, arguably the best RB in the NFL, your team gets the top spot. In every game that Bell was active for, he logged at least 91.2 percent of the Steelers’ offensive snaps in all but three games and one was because of injury. Pittsburgh utilizes Bell as a true cowbell/workhorse back as his 781 regular season snaps ranks third in the NFL despite missing the first three weeks of the season. 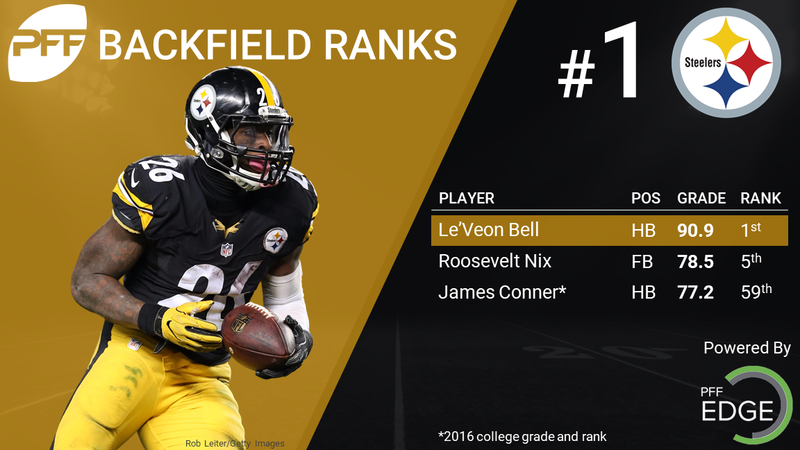 With three straight seasons grading as an elite and complete back, Bell and the Pittsburgh Steelers top this list with little competition. I could mention that the team drafted James Conner, a promising talent out of the University of Pittsburgh, and signed Knile Davis this offseason but it’s difficult to see a scenario in which either plays more than a handful of snaps per game. FB Roosevelt Nix completes the Steelers backfield as the No. 4 graded run blocker at 79.5, but the star power of Bell with his ridiculous vision, patience and plant-cut burst make him a terror for any defense. Take away the off-field distractions of the Cowboys for a moment and what they have on the field in their backfield has a legitimate shot of unseating the Steelers for the top spot on this ranking by season’s end. 2016 No. 4 overall pick Ezekiel Elliott had high expectations as a rookie and surpassed them all as he graded as the second-best running back in the NFL at 88.8. ‘Zeke’ deploys great vision and power to make his yards while also contributing solidly as a receiver and blocker out of the backfield. After a slow start to the season forcing just seven missed tackles on 118 touches and an elusive rating of just 15.3, Elliott started shedding tackles much more frequently. He forced 38 on 236 touches and an elusive rating of 49.6 from Week 6 to the end of the season – good for 16th in the NFL (Le’Veon Bell’s 51.6 ranked 14th during that span). Dallas also has solid backup options in Darren McFadden (70.7 2016 run grade) and Alfred Morris (47.7). While their grades aren’t anything to write home about, they both have experience and success in the NFL and don’t become major liabilities to the team when spelling Elliott. Add to the mix one of the best run blocking fullbacks in the game in Keith Smith (82.4 run block grade, No. 2 overall) and the Cowboys have a complete backfield. LeSean “Shady” McCoy headlines this unit but when you have the best running quarterback in the NFL in Tyrod Taylor (87.1 running grade, No. 1 among QBs) and add the best run-blocking fullback in Patrick DiMarco (82.8 run block grade, No. 1 among FBs) in free agency, it just makes the unit all that much stronger overall. McCoy looked like he was a shell of himself in 2014 but has proved all his doubters wrong with two very strong seasons in Buffalo. He had one of the best seasons of his career in 2016 grading at 85.0, No. 7 among running backs. With a career-high elusive rating of 52.0, forcing 61 missed tackles on 284 touches in 2016, McCoy is primed for another big season, especially with the addition of DiMarco. Add on Taylor’s rushing abilities and his 577 yards, 6.1 average, six touchdowns and 20 forced missed tackles and Buffalo’s backfield is even more dangerous on the ground. David Johnson wasn’t quite the workhorse back that Bell was in Pittsburgh, but he was pretty close as he led the league in snaps at 964, playing 83.7 percent of his team’s snaps. He topped 90 percent in six games and vies for the best all-around RB in the league with only his blocking grade holding him back. Johnson was the only RB in the NFL to grade at an elite level as a receiver and was well ahead of the second best receiving back in New England’s James White (92.7 vs 86.0). Johnson was still very good as a runner but his 2.5 yards after contact per carry was tied for 26th in the NFL. When your top back gains 879 yards receiving while forcing 27 tackles, it jolts the team to a Top 5 unit in the NFL. Add in solid backup options in Andre Ellington, Kerwynn Williams and rookie T.J. Logan, and the Cardinals are sitting pretty. A dual-threat backfield of Devonta Freeman (83.3, No. 8 overall grade) and Tevin Coleman (79.2, No. 16 overall) rounds out the Top 5. 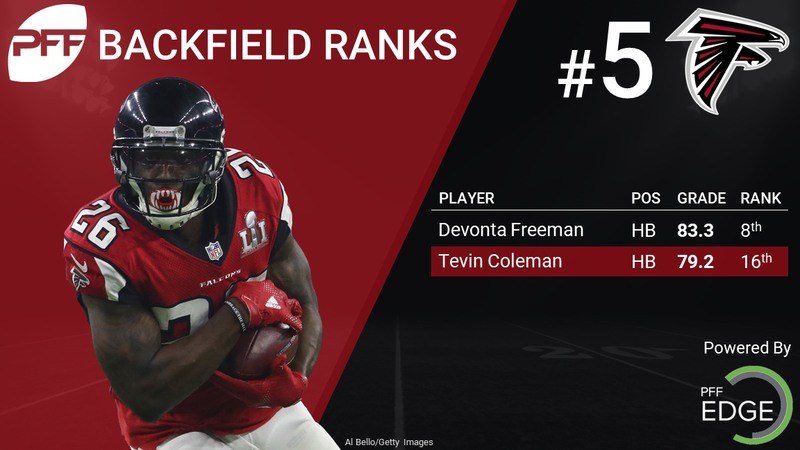 Both excel out of the backfield as receivers as Coleman tops the league’s RBs at yards per route run at 2.58 and Freeman finished seventh at 1.59. Coleman’s 81.3 receiving grade was No. 4 overall in 2016 while Freeman’s was No. 8. Coleman wasn’t quite as strong as a runner though as his 74.9 grade ranked 23rd in the NFL. Where Freeman sets himself apart is his full skillset and he shows his complete ability with the eighth best running grade at 81.9. The strength of this unit comes from a big size-speed-power advantage as the one-two punch of DeMarco Murray and Derrick Henry is difficult for teams to handle. Murray bounced back from a horrendous season in Philadelphia to revive his career, though his 78.9 overall grade and 34.4 elusive rating aren’t great, it’s the combination of the two that make the unit so good. Henry often came in to spell Murray and his power and size wore teams down. Henry’s 57.9 elusive rating ranked No. 7 in the NFL as he forced 27 missed tackles on 123 touches. Both were solid as pass-protectors as was fullback Jalston Fowler, and if Henry gets more carries as expected, the unit should only improve. The Saints will be an interesting team to watch just because of how head coach Sean Payton will utilize Adrian Peterson and Mark Ingram. Peterson has been one of the best backs in the NFL since getting drafted in 2007 but his struggles as a receiver and pass-protector are well documented. Ingram has been a solid back throughout his career and topped 1,000 yards for the first time last season, as he had career-marks in yards per carry after contact (3.1) and forced missed tackles (43). Peterson has missed essentially two of his last three seasons due to injury but still graded well in 2015. Add rookie Alvin Kamara, a draft prospect favorite of many PFF analysts, and the Saints backfield will be loaded in 2017. If Marshawn Lynch returns to his tackle-breaking form after taking a year off, this unit could top the list by the end of the season. In his last two fully healthy seasons (2013 and 2014) with Seattle, Lynch racked up a monstrous 214 forced missed tackles on the ground and an additional 24 as a receiver. It’s hard to fathom he’ll put up numbers like that again but his presence can’t be ignored. Add to the mix the returning No. 1 elusive back in 2016 in Jalen Richard (86.0), a solid change-of-pace back in DeAndre Washington and colleague Mike Renner’s draft “my guy” in Elijah Hood, and the Raiders have a full and complete backfield. Perhaps the most anticipated backfield to watch this year will be in Carolina with the combination of Cam Newton and Jonathan Stewart’s power-running game and rookies Christian McCaffrey and Curtis Samuel’s zone/gadget game. Newton is utilized on several designed QB power runs with Stewart leading the way as a blocker (and formerly Mike Tolbert) but it’s a system that takes its toll on the quarterback as shown by his declining running grade (just 46.2 in 2016). With the addition of McCaffrey, expect to see fewer designed runs for Newton and a bigger utilization of a spread/zone concept. Stewart declined in 2016 (84.2 2015 grade, 74.7 2016 grade) and has reached the age of 30 so his role most likely reduces. A huge favorite among PFF analysts, McCaffrey is the future and his blend of speed, patience, vision and agility should make him successful early. 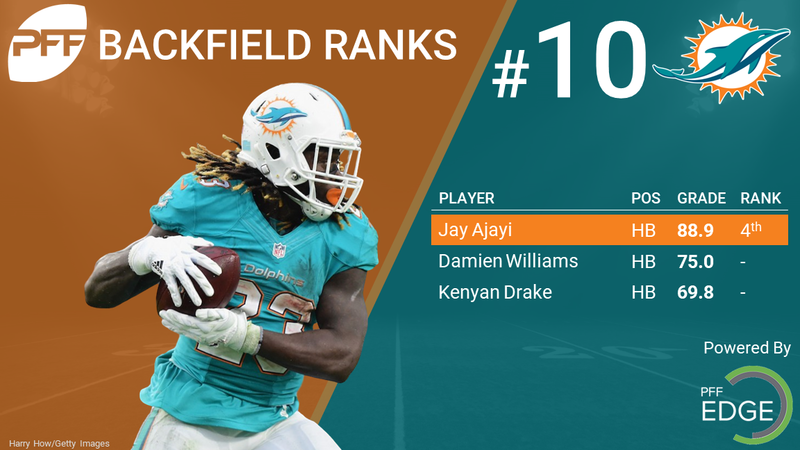 We were high on Jay Ajayi when he was drafted and after some hiccups along the way, he’s proved us right as his 87.5 overall grade ranked No. 4 in the NFL. Among full-time backs, Ajayi’s 71.6 elusive rating was the best in the NFL (No. 4 when including spell and part time backs) as he shed 60 tackles as a runner on 276 carries. Combine that with his 3.37 yards per attempt after contact, also top mark among full-time backs, and Ajayi came into his own under first-year head coach Adam Gase. Add productive backup Damien Williams (75.0) to the mix and the backfield becomes dangerous. Williams is best as a receiver (77.9 receiving grade), where Ajayi is weakest, so they complement each other well. After an incredibly disappointing rookie season (46.4 overall grade) plagued by fumbles, Melvin Gordon bounced back with a very solid season (83.1) that was cut short by injury as he missed most of the last four games. Throw in back up Andre Williams (87.1) and the Chargers have a strong backfield with big upside. Gordon forced more missed tackles as a rookie (46 vs 45) on fewer touches (217 vs. 295) but put the ball on the ground five more times and didn’t score a touchdown and rather, saw the end zone 12 times in 2016. Add in the fact he almost doubled his yards per reception (5.8 vs 10.2) and improved his after contact yards by 0.3 per carry. A fully healthy Gordon could potentially carry the Chargers to the postseason..
Bears fans might get upset about missing out on the Top 10 with how good of a runner Jordan Howard was as a rookie but this ranking is more about what else the team has in the backfield. Howard’s 86.4 run grade ranked No. 4 in the NFL and his 55.2 elusive rating was No. 11, but where he struggles is in the passing game as his 42.3 receiving grade ranked No. 49. While Howard does some great things with the ball in his hands when he catches it, he did however drop eight targets – a drop rate of 21.62 that ranked last out of 46 eligible backs. While Jeremy Langford has experience, he struggles to create his own yards and Ka’Deem Carey is strictly a change-of-pace back that struggles as a receiver. FB Michael Burton was solid as run-blocker, albeit on just 95 snaps. A down year from both backs last season convinced the Jaguars to select Leonard Fournette with the fourth overall pick in the 2017 draft. T.J. Yeldon was a bit below average with his 72.7 overall grade and failed to improve upon an impressive rookie season that saw him average over 4.0 yards per carry and forced 12 more missed tackles than in 2016. Chris Ivory (44.2 overall grade) failed to live up to his play in New York as he dipped below 4.0 yards per carry for the first time in his career. Fournette was injured his final season in college and struggled to create for himself but in 2015, he led all college backs with 85 forced missed tackles as a runner. The defending World Champions let power back LeGarrette Blount (52.4 overall grade) go and signed Mike Gillislee (80.9. 13th overall) away from division foe Buffalo Bills. 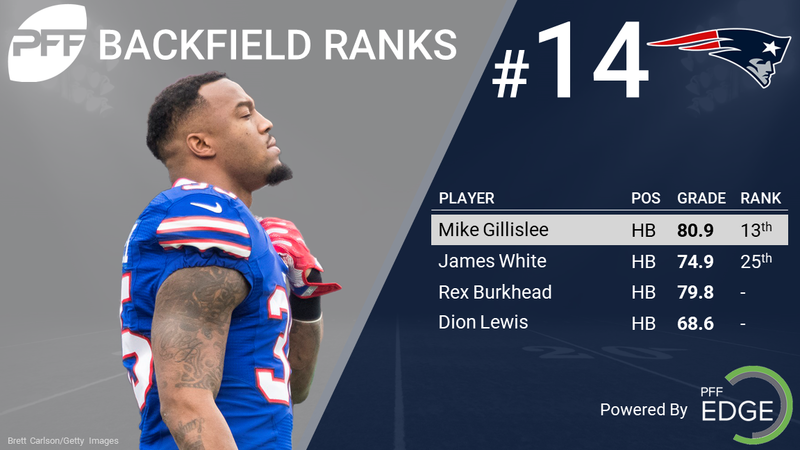 Almost a non-factor as a receiver as he’s seen just 18 targets in two seasons, Gillislee runs with power forcing 16 missed tackles averaging 3.3 yards per carry after contact. Pair him with the second-best receiving back in the NFL in James White, who averaged 1.84 yards per route run and the Patriots don’t skip a beat in their backfield utilization. With the No. 3 FB leading the way in James Develin, Gillislee should give the Patriots and Tom Brady the strongest backfield they’ve had in years. The backfield duo of Isaiah Crowell and Duke Johnson should provide HC Hue Jackson with plenty of options as Crowell had a mini breakout 2016 and Johnson has established himself as an up-and-coming receiving back. Crowell started 2016 on a tear as he sported an impressive 69.8 elusive rating forcing 15 missed tackles on 81 touches while averaging 3.77 yards per carry after contact. He regressed as the Browns went pass-happy when trailing most of the season, but still finished the season with the league’s best breakaway percentage as he gained 47.5 percent of his yards on 15 or more yard runs. Johnson averaged the third most yards per route run at 1.86 and sported a 72.5 elusive rating as he forced 34 missed tackles on just 126 touches, including the second most (21) in the receiving game. The Vikings have had quite the shakeup in their backfield this season as they said goodbye to future Hall of Famer Adrian Peterson, signed Latavius Murray from Oakland and drafted former Florida State RB Dalvin Cook. Murray (76.6) forced fewer missed tackles (20) than former teammate Jalen Richard (21) on 112 more carries. Dalvin Cook was explosive in college as he finished his career leading the nation with 91 forced missed tackles while averaging 4.2 yards per attempt after contact. Solid out of the backfield as a receiver, the duo of Cook and Murray should produce better for the Vikings than what a combination of an injured Peterson, Matt Asiata (50.5) and Jerrick McKinnon (49.2, still on the team) provided in 2016. The Eagles have made effots to put more pieces around QB Carson Wentz and they did so in the backfield signing LeGarrette Blount and drafting Donnel Pumphrey out of San Diego State. Philadelphia will have a crowded backfield, as Darren Sproles (74.3 overall grade, 28th) and Ryan Matthews (70.5. 40th) return though both have several years of tread worn on their legs. That said, Sproles continues to impress, although it appears Pumphrey was brought in to eventually replace the versatile back. Blount still is able to produce but dipped below 4.0 yards per carry for the first time in his career (excluding injury shortened 2012). Will the real Doug Martin please stand up? Impressive as a rookie and after a seemingly comeback season in 2015 that earned him a big contract, Martin disappointed in 2016 with a 66.5 season grade that ranked 44th. Martin will start the season suspended for violating the substance abuse policy and Jacquizz Rodgers (81.6, 11th overall) will begin the season along with rookie Jeremy McNichols. Rodgers has been a solid back in his career and had somewhat of a breakout year in 2016 with a career-high rushing grade of 81.7, which ranked him 10th overall. 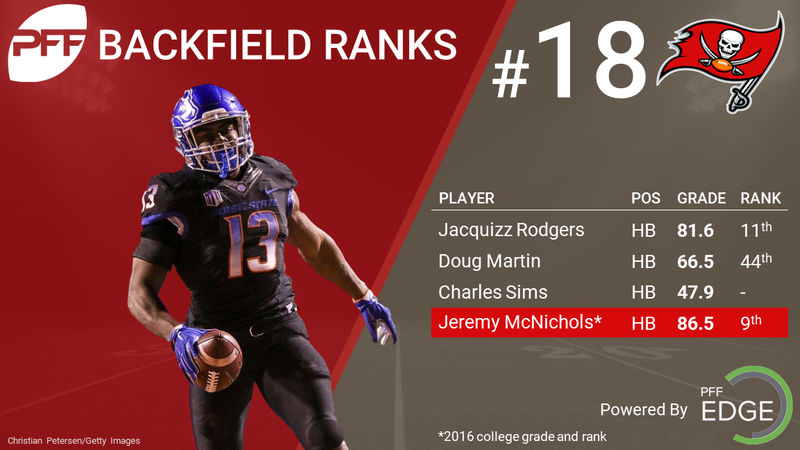 McNichols graded very well in college and forced 62 missed tackles his final year while racking up 43 touchdowns on the ground the past two seasons. Lamar Miller was oft underutilized in Miami and made his way to Houston to become a focal point of the offense. He didn’t take full advantage of the opportunity as he had the worst season of his career as he dropped from 2.8 yards per carry after contact in 2015 to just 1.9 in 2016 along with forcing two fewer missed tackles on 124 more carries. If Miller can find his old form, the Texans backfield unit will rank much better by the end of the year as they have a strong FB in Jay Prosch (76.3 run block grade, sixth among FBs). The Jets find themselves not in the bottom third of a position ranking and that’s in part thanks to Bilal Powell’s strong finish to 2016 as he put up three very impressive games. He ended the season with a 85.1 grade forcing 21 missed tackles on just 131 carries. He spells Matt Forte but should see a bigger role with former Chicago Bear turning 32 by the end of the season. The Jets drafted Elijah McGuire out of UL-Lafayette who impressed as a sophomore in 2014, but hasn’t lived up to those lofty standards he set. If Green Bay would give Ty Montgomery the ball more often, they might rank higher on this list. But when you utilize the most productive back, per carry in the NFL fewer than 10 touches a game and draft three additional running backs, it tells a little bit about your plans for 2017. Montgomery’s 97.6 elusive rating was an NFL best among backs with a minimum of 100 touches as was his ridiculous 4.59 yards per attempt after contact. FB Aaron Ripkowski is a solid run-blocker but the key for the Packers will be how they utilize rookies Jamaal Williams, Aaron Jones and Devante Mays. 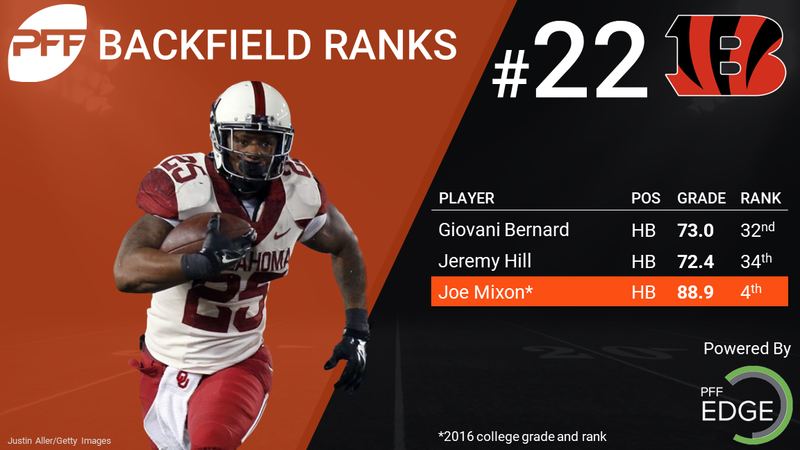 The Bengals return Jeremy Hill and Giovani Bernard and drafted Joe Mixon out of Oklahoma. If Mixon busts out like his talent ability is capable of, the Bengals season outlook could be drastically different. Hill has been the featured back in Cincinnati the last three seasons but his time may very well be at an end with Mixon in town. Hill has posted below average rushing seasons every year and hasn’t shown the progress necessary to be a lead back. Bernard is a good change-of-pace back but also regressed last year and finished the season injured. Mixon has a lot on his shoulders to turn the fortunes of the Cincinnati run game around. The Seahawks added Eddie Lacy (82.8 overall grade, which would have ranked him 10th, had he qualified) in free agency and have put him on a strict, incentive-laden weight-loss schedule. When in shape, Lacy has proven to be a bruising back capable of running both power and zone schemes. Thomas Rawls (81.7, 10th) graded well and CJ Prosise showed promise as a receiving threat (78.7, T-8th if qualified) but the Seahawks are relying on Lacy to bring back a physical presence that they’ve missed since Marshawn Lynch was healthy. Lacy did force an impressive 19 missed tackles on 71 attempts last season, sporting a 95.4 elusive rating when he was active and healthy in 2016, so a healthy Lacy could very well bring that physicality. The Lions have talent in the backfield in Ameer Abdullah and Theo Riddick but with Abdullah coming off a torn ligament in his foot, it’s uncertain how he’ll bounce back. Zach Zenner is a big back but his 58.0 overall grade was 48th in the NFL. Riddick (84.7) and Abdullah (82.9) are excellent receiving backs and complement the quick, spread-it-out passing game of Matt Stafford. Each of their receiving grades ranked them third and fourth, respectively. Detroit signed Matt Asiata from Minnesota but he has graded poorly throughout his career. Todd Gurley and fellow first-rounder Melvin Gordon have had two polar opposite seasons to start their careers. 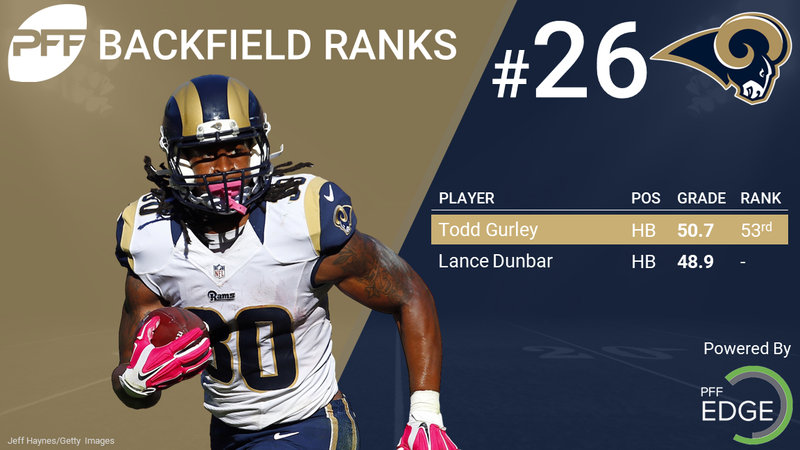 After a strong rookie season, Gurley massively declined in 2016 to a 53rd ranked 50.7 season grade. With new head coach Sean McVay in town, Gurley should be in line to have a bounce back year but its tough to say how much so. Running backs needs to be able to show patience and create yards on their own and Gurley was able to do neither in 2016 as he forced just 28 missed tackles and gained 2.2 yards per carry after contact. Lance Dunbar (48.9) will spell Gurley and FB Cory Harkey (73.4 run-block grade) will lead the way, though Sam Rogers was drafted and will compete for that starting fullback position. The Giants ran 11 personnel seemingly every play in 2016 and have given no indication to add to that first number and every reason to believe that they’ll continue to employ even more WRs in 2017. With several one-back backfields to go around in New York, the Giants have few reliable options. Shane Vereen will hope to stay healthy after twice injuring his triceps in 2016, Paul Perkins (72.3) graded as the 35th best back in 2016 and Shaun Draughn (53.5, 49th) didn’t fare any better in his season with San Francisco. Wayne Gallman was drafted out of Clemson and he’ll could be solid change-of-pace back. Carlos Hyde finally put together a fully healthy season in the NFL but didn’t thrive in Chip Kelly’s hurry up, no huddle offense. With Kyle Shannahan in town, Hyde could very well break out in 2017, especially with the No. 1 graded FB from 2016 in Kyle Juszczyk leading the way. The 49ers drafted Joe Williams out of Utah to compete with Hyde but he never graded well in college and only forced 31 missed tackles in 2016 in the Pac-12. There has been a lot of noise about a competition among the running backs, but as long as Hyde stays healthy, it should be his job and has potential to top 1,000 yards for the first time in his career. Despite the Chiefs drafting one of several PFF analysts favorite (including mine) running backs this year in Kareem Hunt, Kansas City finds themselves in the bottom four of this list because of what they return from 2016. Spencer Ware (77.2, 19th overall) played well, as his 49.8 elusive rating ranked 17th in the NFL, forcing 45 missed tackles on 257 touches. Charcandrick West (51.5, 51st) struggled to spell Ware with an elusive rating of 29.2, forcing just 15 missed tackles on 119 touches. Hunt was electric in his college career at Toledo as he posted the best running back grade in all of college football in 2016 and forced 76 missed tackles on 261 attempts in addition to 22 more on 66 receptions. 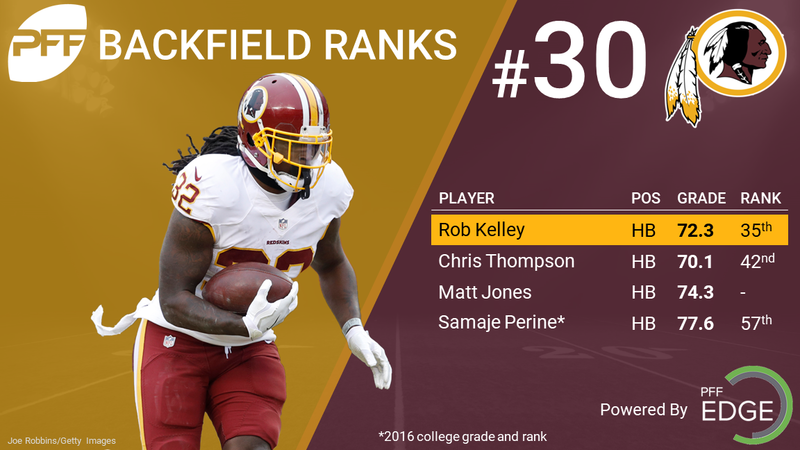 The Redskins have no household names in their backfield and perhaps the most recognizable one would be Samaje Perine, the rookie drafted in the fourth round. Most famous for rushing for an NCAA record 427 yards over Kansas in 2014, Perine will compete with Rob Kelley (72.3, T-35th) and Chris Thompson (71.0, 42nd) for snaps. No runner graded particularly great, but they both put up solid numbers, with Thompson’s 61.6 elusive rating and 3.13 yards after contact per attempt the best on the team. Kelley wasn’t far behind at a 61.5 and 2.84, respectively. Terrance West and Kenneth Dixon return although Dixon will face a four-game suspension to start the season. West (80.3, 15th overall) had a good season as both a runner (78.7, 15th) and receiver (76.6, 10th), cracking 4.0 yards per carry for the first time in his career, though his 39.4 elusive rating was just 23rd in the NFL. Danny Woodhead was brought in to spell the unit and should see significant snaps and checkdowns from QB Joe Flacco, but his production has wavered two of the past three seasons and his 48.3 grade is below replacement level. The Colts continue to do nothing to help take a load off Andrew Luck’s ailing shoulders as they employ a backfield consisting of Frank Gore (62.8, 47th overall), Christine Michael (73.4, 30th) and Robert Turbin (72.0, T-38th). With a struggling offensive line, the Colts will most likely lead the NFL in pass attempts, and Gore finished 54-of-55 players in elusive rating at 15.7, as he forced just 23 missed tackles on 301 touches. Michael fared well in elusive rating last year as his 50.8 rating was 15th in the NFL and he forced 26 missed tackles on 137 touches. The Colts may need to look at the waiver wire on cutdown day.